A MILLION NATIVES are carried every year in these fourth-class four-wheeled carriages. There are two main railways in Morocco - the Tangiers-Fez Railway and the Moroccan Railways Company. A standard-gauge line linking the Moroccan and Algerian systems was completed in 1934. Its construction was due to the efforts of Marshal Lyautey, the French soldier-administrator. ONE of the romances of railway engineering is the way in which the great natural difficulties abounding in the states along the south shore of the Mediterranean Sea have been conquered and up-to-date transport systems have been provided. Although the 3,000-odd miles of railway in Algeria have grown up gradually since 1860, and the 1,200-mile system in Tunisia since 1876, Morocco knew no railway at all before 1908, and standard gauge lines did not appear there until after the war of 1914-18. This has been an advantage in many ways, for the 1,100 miles of line now in operation in the Sultanate are among the best equipped in the world, and have no ancient and worn out rolling-stock to disgrace them. Developed from numerous military tracks laid to a gauge of only 60 cm (just under 2 ft), the lines of the Moroccan Railways and of the Tangiers-Fez Railway, the two big companies in the country, are largely worked electrically. The prewar lines were built simply to assist the French Foreign Legion in subduing the war-like sheikhs in and around the Riff, but in 1915 a civilian service was begun. A wilder, dirtier, and more uncomfortable journey could hardly be imagined than that from the Algerian frontier to the forbidden cities of Taza and Fez. which, before the coming of the railway, had scarcely known a European. Indeed, of Taza it is said that no white man had entered the city walls before the French storming party, in 1914, just before the beginning of the European war. 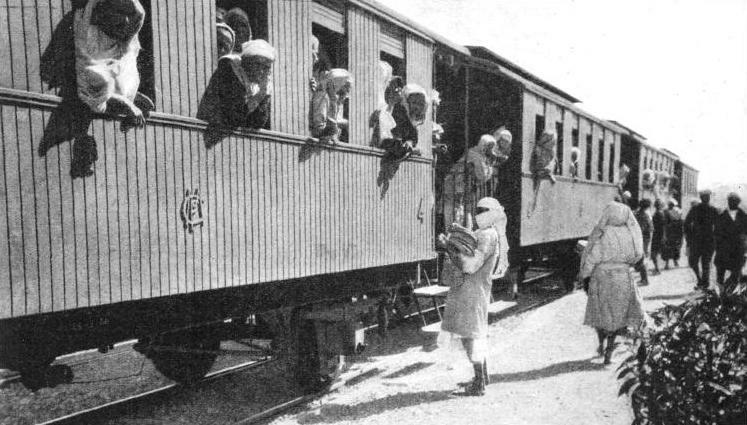 A certain number of “fast” trains were run for the convenience of officers and business men, but they consisted simply of a four- or five-seater motorcar mounted on railway wheels which pulled a light, open coach, and took ten hours to cover the 145 miles from Oudjda to Taza. The slow trains were not allowed to exceed a speed of fifteen miles an hour. The fine modern railways of Morocco are due largely to the great French soldier-administrator, Marshal Lyautey, who, after the Armistice, pushed forward the construction of well-laid main lines providing communication between Algiers, Fez, and the Atlantic ports. The Moroccan Railways Company formed in 1922, took over the old military routes. It now controls all the standard-gauge lines in the country except that stretching from Fez to Tangiers, opposite Gibraltar. This line belongs to the Tangiers-Fez Railway sixty per cent of whose capital is owned by French and forty per cent by Spanish investors. It runs through all the three “zones” into which Morocco is divided - the International Tangier, the Spanish, and the French. The Marshal lived to see the completion of his work, though the new line between Fez and Algiers was not opened through-out until May, 1934. The last section between Fez and Taza was opened officially by the Sultan of Morocco, and a French-controlled through route is now in existence between Marrakech (Morocco City) and Tunis, a distance of 1,505 miles. The French also control the 270 miles of railway south of Tunis to the borders of Libya, but this is a metre-gauge line, and through working is not possible. THE MAIN RAILWAY SYSTEMS of Northern Africa are clearly shown on this map. Before 1860 there were no railways in this part of Africa; to-day there are over 5,000 miles of route. Of the 920 miles of standard-gauge line which have been built in Morocco during the last dozen years, no fewer than 520 have been electrified since 1917. The electrification was carried out to make use of the great water power resources of the Atlas Mountains, that grim and forbidding chain which stretches across the hinterland of Morocco and Algeria, dividing the fertile land near the coast from the burning sand and rocks of the Sahara. The first electric trains were those taking the phosphate traffic from the big mines near Kourigha down to the Atlantic port of Casablanca, which, in 1914, was merely a big native village in a district almost fanatically opposed to European penetration. Now it has trams, railways, big hotels and shops, a small English colony, and a harbour which takes ocean-going steamers and exports almost a million tons of phosphates in a year. The importance of the traffic in phosphates is due to their extensive use as fertilisers in agriculture. Leaving the new all-white station at Marrakech, the train, composed of a dining- or sleeping-car (depending upon the time of day), one or two first- and second-class carriages, and the same number of fourth-class carriages for natives, runs downhill over grades as steep as 1 in 66 to Casablanca, joining on the way the branch from Kourigha. Down these long, steep banks the train must be braked very carefully to prevent it from running away. All the trains are fitted with the Westinghouse brake, which is used for making the station stops; but, to hold the train at a steady speed down mile after mile at 1 in 66, electric regenerative braking is employed on the locomotive. This means simply that when the current is turned off and the train is coasting downhill, the electric motors on the axles, instead of receiving current to drive them, act as dynamos and generate current, which is passed back into the trolley wire. This process keeps the motors and wheels turning at a certain definite speed, and if the locomotive tries to run faster a very powerful braking force is set up in the motors. MARRAKECH STATION, MOROCCO, handles both steam and electric trains, and is a starting-point for local and long-distance road services in conjunction with the railway. A through route by rail from Marrakech to Tunis - a distance of 1,505 miles - is now open. Beyond the station can be seen a spur of the famous Atlas Mountains. The current sent back into the overhead wire can be used by other trains going uphill. This ingenious system of braking not only renders absolutely safe the operation of the trains going down steep gradients, but also reduces the amount of current which must be obtained from the power station. To operate the regenerative brake the driver merely has to move a hand switch; after that everything is automatic. Onward from Casablanca the line is level and runs closely alongside the Atlantic through Rabat to Kenitra, now known as Port Lyautey, after the man who raised it from a Moorish village to the second port of Morocco. It was in this section that Lyautey took the greatest personal interest, and at Rabat be insisted on the railway engineers carrying the line under the town in three tunnels, to preserve the Moorish aspect of the old city. After passing the docks at Port Lyautey, which lies two miles up the river, the railway swings inland to Petit Jean. At this junction the Moroccan Railways meet the Tangiers-Fez Railway, and sleeping, dining, and through carriages are exchanged, some going north to Tangiers and the Strait of Gibraltar, and others up to Fez and eastward to Algeria. The Tangiers-Fez Railway is electrified between Petit Jean and Fez, a mountain division with many sharp curves. The locomotives and carriages are very similar to those of the Moroccan Railways. 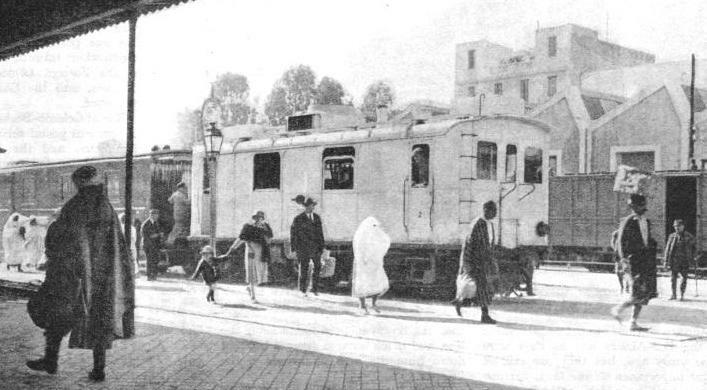 Although there are 355 miles of electrified line from Marrakech, certain trains are still worked by steam in the neighbourhood of Casablanca, but most of the steam trains are now transferred to the 230-miles line running east from Fez to the Algerian frontier. This line belongs to the Moroccan Railways, which is thus split into two divisions, the east and the west, divided by the Tangiers-Fez Railway. The fifty steam engines used are of the 4-6-0 tender and 2-8-2 tank types, built to the standard designs of the Paris-Orleans Railway, to which railway most of them at one time belonged. But though they are French in design some of them are British built, coming from the works of the North British Locomotive Company in Glasgow. The twenty-six electric locomotives are all of the double-bogie type and develop 1,400 hp, but for passenger trains between Casablanca and Port Lyautey there are ten motor-coaches which haul two or three trailers. WHERE EAST AND WEST MEET. A typical scene in a Tunisian railway station, showing a Diesel-electric locomotive at the head of a passenger train. Diesel locomotives in North Africa have a great advantage over the steam engine, as water is both scarce and bad. Perhaps the most outstanding event in the history of Moroccan Railways was the opening in May, 1934, of the main line to Algiers. This long line partly follows the track of the old military 60 cm gauge railway, but at places makes considerable deviations to avoid the sharp curves and terrific grades of the latter. Nevertheless, so wild and mountainous is the country through which passes this vital link in the great Morocco-Tunisia trunk route, that the 230 miles of line cost 600 million francs to build. Up to 1,000 Europeans and 10,000 natives were employed for over four years. Military stations are not so prominent on the Fez-Algiers line as they were some years ago, but they are still of major importance on the long, narrow-gauge branch which extends down behind the Atlas Mountains from Guercif to Midelt. This line was built solely for military purposes, and its principal activity is the transport of Foreign Legionnaires and French Senegalese troops. Many of the latter are married to women from the Congo and French Equatorial Africa, and the stations down this line show many types of people foreign to the country. A PASSENGER TRAIN IN MOROCCO. The fine system in Morocco is due to Marshal Lyautey, the famous French soldier, who provided railway links between Algiers, Fez, and the Atlantic ports. In 1922 the Moroccan Railways Company took over the old military routes. Running parallel with this branch, but close to the Algerian frontier, is the line of the private East Moroccan Railway Company, but this is now under the management of the Moroccan Railways. It starts from Oudjda, the frontier station on the Fez-Algiers line, and runs due south for 180 miles to the manganese mines at Bou Arfa. Russian dumping has made the working of the manganese ore unprofitable; coal has, however, been found along the line, and much esparto grass is brought down from the high tablelands of the interior. But the chief interest of the East Moroccan Railway is that the French authorities have approved its possible use as the first stage of the great Trans-Saharan Railway, which is to run from the Mediterranean to Timbuctoo, and, eventually, on to the Guinea coast. Owing to the waterless and desolate nature of the Sahara, this line will have to be worked by Diesel locomotives, which will have no difficulty in running, without a stop if necessary, over the 1,000 miles separating Bou Arfa and Timbuctoo. Should the line ever be opened throughout, it will be possible to travel from London to Timbuctoo in four and a half days. Should this Trans-Saharan Railway be pushed forward, it would make a connection with the southern terminus of a long narrow-gauge branch of the Algerian State Railways which extends from the Mediterranean port of Oran, through the Atlas Mountains to Colomb-Bechar, and on over the desert to Kenadza. Constructed almost entirely for military reasons, this line passes through the region where training is given to the Foreign Legion, the Zouaves, and the Chasseurs d’Afrique. It is at Colomb-Bechar that the present postal service for Timbuctoo and the French Sudan is handed over from the railway to automobiles, and specially-built postal vehicles are convoyed every fifteen days over the 1,000 miles of desert to the banks of the Niger. Two other narrow-gauge military railways run far south into the desert, but the main Algerian lines run east and west, connecting the big towns of Oran, Algiers, Constantine, and Phillipeville. Originally there were three big railway systems, the Algerian State, the Algerian Western, and the PLM (Algerian). The last named was the property of the famous Paris, Lyons and Mediterranean Railway, whose trains connect with the boats sailing to Algiers from the Joliette Quay at Marseilles. Shortly after the war of 1914-18 the PLM (Algerian) was given the right of working the Algerian Western. Recently the Algerian State and PLM Railways have come to such a close working arrangement that they are virtually under one management, the unified system now being known simply as the Algerian Railways. A METRE-GAUGE “PACIFIC” ENGINE as used on the lines of the Tunisian Railways. The Tunisian Railways have 180 steam locomotives on the metre-gauge section. There are some 1,200 miles of line in Tunisia. Surprising developments in the working of express and heavy goods trains have taken place within the last two or three years, principally by the introduction of giant Beyer-Garratt steam engines and Diesel-electric locomotives. The biggest Beyer-Garratts are of the 4-6-2 + 2-6-4 type, and weigh 200 tons. They can haul 650 tons passenger trains at a speed of sixty-five miles an hour on the level, and have touched eighty-two miles an hour, the only time an articulated engine has ever exceeded the “eighty” mark. The 4-6-0 engines used before the Beyer-Garratts could haul trains of only 260 tons weight without assistance on a timing of nine hours for the 260 miles between Algiers and Oran, including a dozen stops. The line has a long, steep bank in either direction, but the Beyer-Garratts are able to haul 440-tons trains over the whole distance in under eight hours, including a dozen stops. Their outstanding advantage is that they are able to do the work of two ordinary engines while having only one boiler, for most of the water in Algeria is of bad quality and corrodes the boiler material very quickly. These engines are fitted with Beyer Peacock’s patent revolving coal bunker, which is a big cylindrical chute with two loading doors on top. When the bunker is full these hatchways are closed, and prevent coal dust from blowing into the cab or heavy rain from soaking the fuel. A small stationary steam engine is fitted alongside the bunker, and by means of gearing turns the whole bunker and its eight tons of coal round when a valve in the cab is opened. This trims the coal down to the front where the fireman can get at it with his shovel. 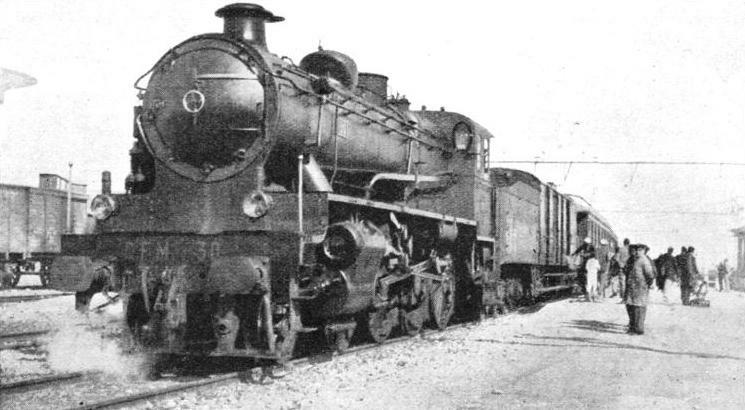 A BEYER-GARRATT locomotive of the 4-8-2 + 2-8-4 wheel arrangement hauling a heavy train on the Algerian Railways. Powerful Beyer-Garratt locomotives are becoming increasingly popular on the Algerian Railways. These Beyer-Garratt passenger engines run on the standard gauge of 4 ft 8½-in. Algeria labours under the disadvantage of four different widths, namely, standard, 3 ft 6-in, metre, and 60 cm. Even Morocco and Tunisia have two different widths - standard and 60 cm gauge in Morocco, and standard and metre gauge in Tunisia. Other Beyer-Garratts are used for heavy goods trains on metre-gauge mountain lines. These have the 4-8-2 + 2-8-4 wheel arrangement, and coal bunkers of the ordinary rectangular type. One of the big Diesel locomotives now hauling trains out of Algiers made history just after it was built by hauling a light express train from Paris to Marseilles, 536 miles, at an average running speed of sixty-two miles an hour without any stops for refuelling. This locomotive is now taking its turn with the Algerian 4-6-0 steam engines in working 250-tons passenger trains between Algiers and Oran. Coming into Algeria from Morocco the first place of note is Tlemcen, once a great Moorish city with a population of over 100,000, but now a pleasant little place with barely 30,000 inhabitants. From there the PLM (Algerian) main line turns seaward to Oran, from which place the trains come out again over the same route for seventeen miles before going on eastward to Algiers. Algiers Station, like that at Oran, is situated alongside the quays, and must be left in the same direction as it is approached. Continuing eastward along the trunk route, the passenger is now travelling on the State Railways, whose lines extend to the Tunisian frontier through a district teeming with Roman remains. The main line passes within a few miles of Constantine, one of the most wonderful. cities in the whole of Africa. Its history goes back to the days of ancient Carthage, when the ruler was a brother-in-law of the famous Carthaginian general, Hannibal. The town itself is enthroned upon a huge isolated pedestal of rock, and the railway, a branch from the trunk line to the Mediterranean at Phillipeville, is carried along a limestone ridge above the city. Cutting the trunk line at right angles near the Tunisian border, and forming part of it for thirty miles, is one of the most remarkable standard-gauge railways in Algeria. Originally forming part of the privately owned Bône-Guelma Railway, it now belongs to the State, and a few years ago was electrified as the traffic was getting beyond the powers of the steam engines provided. COLOMB-BECHAR STATION on the border of the Sahara. It is reached by a long narrow-gauge railway from Oran. Most of the traffic consists of Foreign Legionaries, some of whom can be seen lined up on the right. After leaving the port of Bône the line runs south over level country until it meets the main line, and then starts to climb up tremendously steep grades to reach the phosphate beds and mines in the mountains. 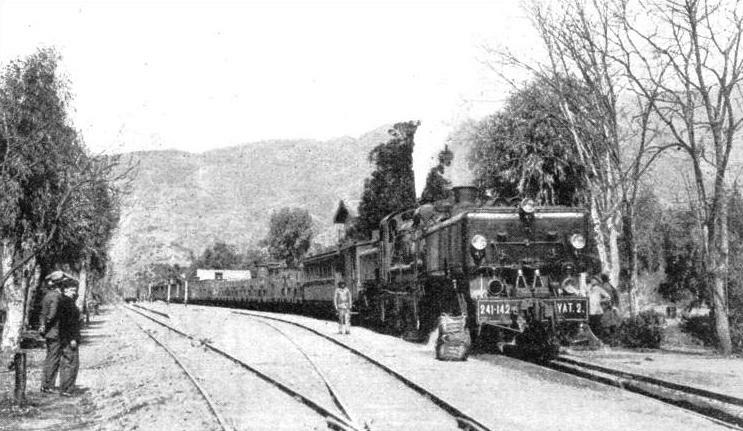 The whole 103 miles of the route from the sea to the terminus at Oued Kheberit were worked by sixty ten-coupled goods and fifteen eight-coupled steam passenger engines. But with over 7,000 tons of phosphates and minerals coming down every day, and passenger trains and returning empties being run over the same single line, the problem of working the line became acute, particularly as the numerous tunnels on the banks were never free from smoke, owing to the frequent trains. The surrounding country is so rough that both doubling the line or laying an entirely new route were out of the question on the score of expense, but electrification saved the day. The seventy-five steam engines, which weighed a total of 5,400 tons. have been replaced by thirty electric locomotives scaling 3,450 tons, and the 2,000,000 tons of phosphates and minerals which go over the line in a year are now hauled in trains weighing 840 tons, instead of the 700 tons of steam days. Moreover, there is now no smoke on the line, and the operating costs are £110,000 a year less. These good results have led to the beginning of the work of electrifying the main line from the junction at Souk Ahras to the Tunisian frontier. The wildness of the country made it impossible to use even road transport in certain regions, and the material for trans-mitting the electric energy from the power station at Bône had to be brought up laboriously on the backs of men and mules, and patiently pieced together on the site. Fortunately, the heaviest electrical machinery was for the sub-stations, which are located alongside the railway; otherwise the material, some of it weighing ninety tons a set, would have taken many months to install. Once over the border into Tunisia the railways deteriorate, although the last section of the great 1,505-mile transversal railway from Marrakech to Tunis is quite good. 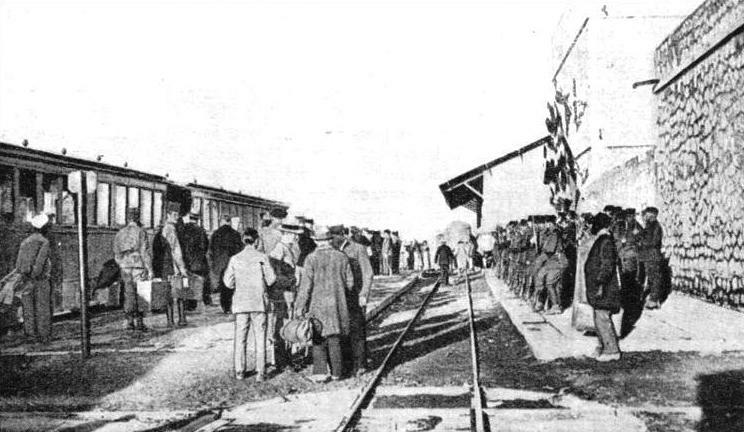 This line is owned by the Government of Tunisia, but is leased, along with other standard and narrow gauge lines in the north of the country, to a French company. The principal attraction of the city of Tunis is its proximity to the site of ancient Carthage, of which practically no trace now remains except in the great museums of Europe. In the southern half of Tunisia is a big narrow-gauge railway called the Sfax-Gafsa, more than three-quarters of whose traffic consists of phosphates and mineral ores, for the shipment of which it has its own harbour at Sfax. The Sfax-Gafsa Railway employs ten coupled engines for goods trains, but for certain passenger services it has two Diesel-electric locomotives, one of which has been at work for many years and is almost the oldest Diesel locomotive of its kind in the world. The use of Diesel locomotives and rail-cars in North Africa is of great benefit, because the water is both scarce and bad. The Tunisian Railways have ordered twenty Diesel rail-cars with the object of surmounting the bad water problem and reducing maintenance costs. THE TENSIFT BRIDGE which carries the line of the Moroccan Railways. The river bed is so soft that during construction caissons had to be sunk to a depth of 60 ft (twice the height of the bridge), so that a firm foundation should be obtained.